Explanation: The unassuming star centered in this sky view will one day be our next door stellar neighbor. 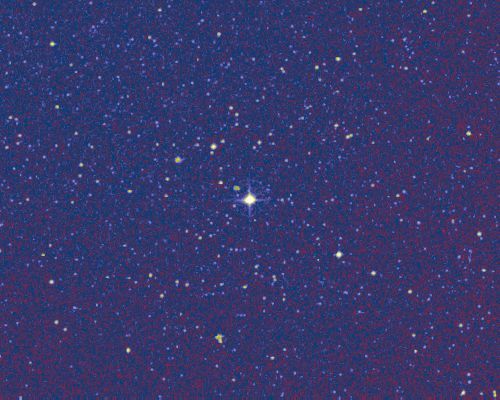 The faint 9th magnitude red dwarf, currently 63 light-years away in the constellation Ophiucus, was recently discovered to be approaching our Solar System. Known in catalogs of nearby stars as Gliese 710 it is predicted to come within 1 light-year of the Sun ... a million years from now. At that distance this star, presently much too faint to be seen by the naked eye, will blaze at 0.6 magnitude - rivaling the apparent brightness of the mighty red giant Antares. Ultimately Gliese 710 poses no direct collision danger itself although its gravitational influence will likely scatter comets out of the Solar System's reservoir, the Oort cloud, sending some inbound. This future stellar encounter was discovered by researchers Joan Garcia-Sanchez and Robert Preston (JPL), and collaborators while studying stars in the solar neighborhood using data from the Hipparcos Astrometry Satellite. The star field shown is based on the Palomar Digitized Sky Survey and is 1/4 degree wide (about half the diameter of the full moon).